A try is scored when the ball is grounded over the opponents’ goal line in the in-goal area. 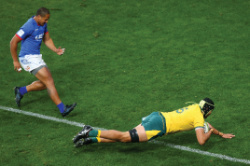 A penalty try can be awarded if a player would have scored a try but for foul play by the opposition. When awarded a penalty after an infringement by the opposition, a team may choose to kick at goal. After scoring a try, that team can attempt to add two further points by kicking the ball over the crossbar and between the posts from a place in line with where the try was scored. A drop goal is scored when a player kicks for goal in open play by dropping the ball onto the ground and kicking it on the half-volley.